Preheat oven to 220C/fan-forced 200C. Grease base of a 20cm round tin with butter. Sprinkle in the sugar and a pinch of cinnamon. 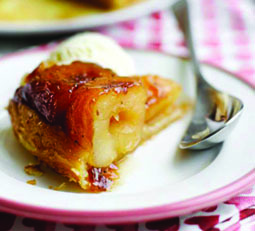 Layer apples on top and put in oven for 15-20 minutes until the fruit becomes caramelised. The apple juices will ooze out at first then thicken into a sauce. Remove from oven. Lay the pastry out and prick all over with a fork. Quickly lay the pastry over the apples. Trim away any excess, allowing a rim of about 2cm and then tuck the pastry snugly round the apples down the inside of the tin. Place the tin in the middle of the oven for 20-30 minutes until the pastry has risen and is firm and golden. When the tart is cooked, leave it to cool in the tin for 5 minutes before running the blade of a knife round the edge to dislodge any pastry that has stuck. Invert a plate over the top and turn out the tart along with any juices. You can flambé with a small glass of Calvados or Cognac.